It’s a good idea to put together a business plan before thinking about launching. It can pave your way, and it will be a very useful tool for you to refer to. It will help you to really see what the industry looks like; and it will help you to identify where your strengths and opportunities are within it. This awareness will help you to feel more confident. It will help to clarify your ideas about how you would like to start building your business; and it could even help you to shape it - into something that works better for you and your market in the long run. What are your dreams for your business? How to do intend to achieve those goals? What obstacles may stop you? A written plan allows you to figure out these answers and discover your weaknesses along the way. By targeting those weak spots now, you can avoid (costly!) problems in the future. So do your homework, find the potential problems and research the solutions now. Get ahead of the game, because one way or another, business owners learn some hard lessons…and it’s better to do that learning in the planning stage! No, you don’t have to outline every minor detail, or make your plan into some stuffy, boring document. This is for you, so make it fun! Be as comprehensive as possible, but focus on addressing the key matters. This section should include your address, telephone, and email address. This is your business in a nutshell. In a few lines, explain your company’s intent, what product(s) you’re selling, and your mission statement. Dive into some details about those products you plan to market, and how you intend to do it! Understanding your expected customer base will help you tailor your product and enable you to better market your product when the time comes. It does no good to make something but not understand how to sell it to customers. Speaking of selling - your plan should include your sales goals. How much merchandise do you intend to move? Build an expected sales spreadsheet of what you anticipate your first quarter, first year, and first five years sales to look like. List out details related to your business type, location, and names of everyone associated. Offer brief bios on anybody working for the company, and list specifics regarding their employment status (full-time, part-time, benefits offers, salary ranges, etc.). Market analysis ties into your niche and who you plan to sell to. Whether you do this or you hire a firm to do it, ensure you answer the basic question: who’s going to buy your product? What are their ages, gender, hobbies, and other relevant demographical information? Another factor in marketing analysis is competition. Who is already selling products similar to yours, what makes yours different, and why should a customer select your product versus somebody else’s? Part of understanding your customer base is knowing how much they are willing to spend. So include your price structure, with wholesale prices, and anticipated markups and profit margins. If you’ve already made some sales, include the data…how much you sold, who bought what, and how much you made. Your marketing section should also include your marketing budget. What do you plan to spend on advertising, catalogues and/or websites, social media, marketing presentations, models, collabs and day-to-day costs? How is your product line going to be made? Since this ties into pricing (your price will be set by the cost of manufacturing), include a spreadsheet of dollar figures outlining everything from fabric to labor expenses. Tie everything together with a tidy spreadsheet breaking out your business budget, income expectations, funding sources, and any other cash flow details which are relevant. Include initial start-up costs and your break even date, too. Write a concise summary of your plan, to include your goals and how you intend to reach them one-by-one as you shift from planning to implementation. The main things to avoid are simply writing a fluff piece, going into unessential details, or entertaining unrealistic notions. You don’t have to have one, but if you want to put all your graphics and spreadsheets here instead of within the body of the plan, then go for it! It’s your business plan, so make it how you want it! 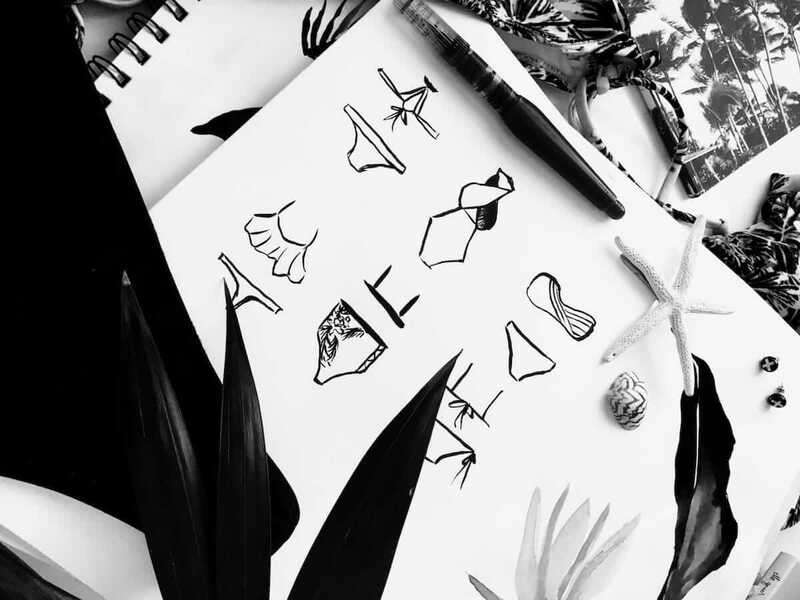 Save this swimwear business template and start drafting on it as soon as you can. A bit here and there - and you'll be ready in no time! Also, we recommend you to grab our manufacturing guide. It covers all bits you need to know for actually developing and manufacturing your swimwear line. Some tips and FAQ based on the 100+ labels we have launched is also in there. Everything you need to know to produce your own label.